What will you do with your math notebook at the end of the school year? Keep it as a reference for the future? Save it as a keepsake? Toss it out? Turn it into confetti? Find your favorite math bits and doodles and make a collage? Lucky for us, our first president kept his math notebooks from when he was a young teenager. And though it’s passed through many hands over the years—including those of Chief Justice John Marshall and the State Department—it has survived to this day. That’s right. You can check out math problems and definitions copied out by George Washington over 250 years ago. They’re all available online at the Library of Congress website. Or at least most of them. They seem to be out of order, with a few pages missing! That’s what mathematician and math history detective Fred Rickey has figured out. Fred has long been a fan of math history. Since he retired from the US Military Academy in 2011, Fred has been able to pursue his historical interests more actively. Fred is currently studying the Washington cypher books to help prepare a biography about Washington’s boyhood years. You can see two papers that Fred has co-authored about Washington’s mathematics here. Washington valued his cyphering books and kept them as a ready source of reference for the rest of his life. This would seem to be particularly true of his surveying studies. Surveying played a big role in Washington’s career, and math is important for today’s surveyors, too. Do you have a question for Fred about the math that George Washington learned? Send it to us and we’ll try to include it in our upcoming Q&A with Fred! Next up, check out this Tessellation Kit. It was made by Nico Disseldorp, who also made the geometry construction game we featured recently. The kit is a lot of fun to play with! One thing I like about this Tessellation Kit is how it’s discrete—it deals with large chunks of the screen at a time. This restriction make me want to explore, because it give me the feeling that there are only so many possible combinations. Langton’s Ant is following a simple set of rules. In a white square? Turn right. In a black square? Turn left. And switch the color of the square that you leave. This ant is an example of a cellular automaton, and we’ve seen several of these here on Math Munch before. This one is different from others because it changes just one square at a time, and not the whole screen at once. There’s a lot that is unknown about Langton’s ant, and it has some mysterious behavior. For example, after thousands of steps of seeming randomness, the ant goes into a steady pattern, paving a highway out to infinity. What gives? Well, you can try out some patterns of your own in the applets on the Serendip website. (previously). And you can read some amusing tales—ant-ecdotes?—about Langton’s ant in this lovely article. I learned about Langton’s Ant from Richard Evan Schwartz in our new Q&A. In the interview, Rich shares his thoughts about computers, art, what to pursue in life, and of course: Really Big Numbers. Check it out, and bon appetit! Meet Nalini Joshi, a mathematician at the University of Sydney in Australia. I’ll let her introduce herself to you. Nalini has an amazing story and amazing passion. What does her video make you think? To hear more from Nalini, you can watch this talk she gave last month at the Women in Mathematics conference at the Isaac Newton Institute in Cambridge, England. Her talk is called “Mathematics and life: a personal journey.” You might also enjoy reading this interview or others on her media page. Nalini Joshi lecturing about solitons. I’d like to share three clumps of ideas that might give you a flavor for the math that Nalini enjoys doing. Most of it is way over my head, but I’m reaching for it! You can, too, if you try. Here’s clump number one. 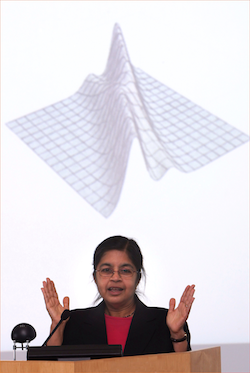 Two of the main objects that Nalini studies are dynamical systems and differential equations. You can think of a dynamical system as some objects that interact with each other and evolve over time. Think of the stars that Nalini described in the video, heading toward each other and tugging on each other. Differential equations are one way of describing these interactions in a mathematically precise way. They capture how tiny changes in one amount affect tiny changes in another amount. To play around with some simple dynamical systems that can still produce some complex behaviors, check out dynamical-systems.org. Vlasov billiards was new to me. I think it’s really cool. The three-body problem is one of the oldest and most famous dynamical systems, and you can tinker around with examples of it here and here. There’s even a three-body problem game you can try playing. I’m not too crazy about it, but maybe you’ll enjoy it. It certainly gives you a sense for how chaotic the a three-body system can be! Nalini doesn’t study just any old dynamical systems. She’s particularly interested in ones where the chaotic parts of the system cancel each other out. Remember in the video how she described the stars that go past each other and don’t destroy each other, that are “transparent to each other”? Places where this happens in dynamical systems are called soliton solutions. They’re like steady waves that can pass through each other. Check out these four videos on solitons, each of which gives a different perspective on them. If you’re feeling adventurous, you could try reading this article called What is a Soliton? Making a water wave soliton in the Netherlands. A computer animation of interacting solitons. Japanese artist Takashi Suzuki tests a soliton to be used in a piece of performance art. Students studying and building solitons in South Africa. Level curves that are generalized Cassini curves. Also, it kind of looks like a four-body problem. The second idea that Nalini uses that I’d like to share is level curves, or contours. Instead of studying complicated differential equations directly, it’s possible to get at them geometrically by studying families of curves—contours—that are produced by related algebraic equations. They’re just like the lines on a topographic map that mark off areas of equal elevation. Here’s a blog post by our friend Tim Chartier about colorful contour lines that arise from the differential equation governing heat flow. The temperature maps by Zachary Forest Johnson from a few weeks ago also used contour lines. And I found some great pieces of art that take contours as their inspiration. Click to check these out! The last idea clump I’ll share involves integrable systems. In an integrable system, it’s possible to uniquely “undo” what has happened—the rules are such that there’s only one possible past that could lead to the present. Most systems don’t work this way—you can’t tell what was in your refrigerator a week ago by looking at it now! Nalini mentions on her research page that “ideas on integrable differential equations also extend to difference equations, and even to extended versions of cellular automata.” I enjoyed reading this article about reversible cellular automata, especially the section about Critters. What move did Black just play? A puzzle by Raymond Smullyan. And this made me think of a really nifty kind of chess puzzle called retrograde analysis—a fancy way of saying “thinking backwards”. Instead of trying to find the best chess move to play next, you instead have to figure out what move was made to get to the position in the puzzle. Most chess positions could be arrived at through multiple moves, but the positions in these puzzles are specially designed so that only one move will work. There’s a huge index of this kind of problem at The Retrograde Analysis Corner, and there are some great starter problems on this page. And perhaps you’d like to hear a little bit about thinking backwards from one of the greatest teachers of chess, Grandmaster Maurice Ashley. Check out his TED video here. I hope you’ve enjoyed finding out about Nalini Joshi and the mathematics that she loves. I asked Nalini if she would do a Q&A with us, and she said yes! Do you have a question you’d like to ask her? Send it to us below and we’ll include it in the interview, which I send to Nalini in about a week. UPDATE: We’re no longer accepting questions for Nalini, because the interview has happened! Check it out! A ghost diagram composed of two different tiles. So writes Paul Harrison, creator of the amazing Ghost Diagram applet. Paul creates all kinds of free software and has his Ph.D. in Computer Science. I found his Ghost Diagram applet through this huge list of links about generative art. A ‘111-‘ tile connected to a ‘1aA1’ tile. Given a collection of tile types, the applet tries to find a way to connect them so that no tile has any loose ends. A tile type is specified through a string of letters, numbers, and dashes. Each of these specifies an edge. You can think of a four-character tile as being a modified square and a six-character tile as being a modified hexagon. Two tiles can connect if they have edges that match. Number edges match with themselves—1 matches with 1—while letter edges match with the same letter with opposite capitalization—a matches with A.
It’s amazing the variety of patterns that can emerge out of a few simple tiles. Here are a couple of ghost diagrams that I created. You can click them to see live versions in the applet. There are many other nice ghost diagrams that Paul has compiled on the site. Also, be sure to check out the random button—it’s a great way to get started on making a pattern of your own. I hope you enjoy tinkering with the ghost diagram applet as much as I have. And now for some more fun: three new games! When I ran across Loops of Zen, I had ghost diagrams on my mind. I think they have a similar feel to them. The goal in each level of Loops of Zen is to orient the paths and loops so that they connect up without any loose edges. I feel like this game—like good mathematics—requires both a big-picture, intuitive grasp of the playing field and detailed, logical thinking. Put another way, you need both global strategy and local tactics. Also, if you like playing Entanglement, then I bet you’ll like Loops of Zen, too. Last week we wrote about Flatland. This book and the movies it inspired describe what it might be like if creatures of different dimensionality were to meet each other. The game Z-Rox puts you in the shoes of a Flatlander. Mystery shapes pass through your field of vision a slice at a time, and it’s up to you to identify what they are. It’s a tricky task that requires a good imagination. Hat tip to Casual Girl Gamer for both of these great mathy games. Steppin’ Stones is a fun little spatial puzzle game I recently came across. You should definitely check it out. It also provides a nice segue to our last mathy item for the week, because a Steppin’ Stones board looks a lot like a Scrabble board. Scrabble, of course, is a word game. Aside from the arithmetic of keeping score, there isn’t much mathematics involved in playing it. In addition, the universe of Scrabble—the English dictionary—is not particularly elegant from a math standpoint. However, it’s the amazing truth that even in arenas that don’t seem very mathematical, math can often be applied in useful ways. From a comic about Prime Scrabble on Spiked Math. In Re-evaluating the values of the tiles in Scrabble™, the author—who goes by DTC and is a physics graduate student at Cornell—wonders whether the point values assigned to letters in Scrabble are correctly balanced. The basic premise is that the harder a letter is to play, the more it should be worth. DTC does what any good mathematician does—lays out assumptions clearly, reasons from them to make a model, critiques the arguments of others, and of course makes lots of useful calculations. One tool DTC uses is the Monte Carlo method. In the end, DTC finds that the current Scrabble point values are very close to what the model would assign. I really enjoyed the article, and I hope you will, too. And since Scrabble is a “crossword game”, I think I’ll leave you with a couple of “crossnumber” puzzles. Here are some straightforward ones, while these require a little more thinking. Have a great week, and bon appetit! P.S. I can’t resist sharing this video as a bonus: a cellular automaton of rock-paper-scissors! Blue beats green, green beats red, and red beats blue. Hooray for non-transitive swirls! Four million grains of sand dropped onto an infinite grid. The colors represent how many grains are at each vertex. From this gallery. We got our first snowfall of the year this past week, but my most recent mathematical find makes me think of summertime instead. The picture to the right is of a sandpile—or, more formally, an Abelian sandpile model. If you pour a bucket of sand into a pile a little at a time, it’ll build up for a while. But if it gets too tall, an avalanche will happen and some of the sand will tumble away from the peak. You can check out an applet that models this kind of sand action here. A mathematical sandpile formalizes this idea. First, take any graph—a small one, a medium sided one, or an infinite grid. Grains of sand will go at each vertex, but we’ll set a maximum amount that each one can contain—the number of edges that connect to the vertex. (Notice that this is four for every vertex of an infinite square grid). If too many grains end up on a given vertex, then one grain avalanches down each edge to a neighboring vertex. This might be the end of the story, but it’s possible that a chain reaction will occur—that the extra grain at a neighboring vertex might cause it to spill over, and so on. For many more technical details, you might check out this article from the AMS Notices. This video walks through the steps of a sandpile slowly, and it shows with numbers how many grains are in each spot. You can make some really cool images—both still and animated—by tinkering around with sandpiles. Sergei Maslov, who works at Brookhaven National Laboratory in New York, has a great applet on his website where you can make sandpiles of your own. David Perkinson, a professor at Reed College, maintains a whole website about sandpiles. It contains a gallery of sandpile images and a more advanced sandpile applet. Hexplode is a game based on sandpiles. I have a feeling that you might also enjoy playing the sandpile-inspired game Hexplode! Next up: we’ve shared links about Fibonnaci numbers and prime numbers before—they’re some of our favorite numbers! Here’s an amazing fact that I just found out this week. Some Fibonnaci numbers are prime—like 3, 5, and 13—but no one knows if there are infinitely many Fibonnaci primes, or only finitely many. A great place to find out more amazing and fun facts like this one is at The Prime Pages. It has a list of the largest known prime numbers, as well as information about the continuing search for bigger ones—and how you can help out! It also has a short list of open questions about prime numbers, including Goldbach’s conjecture. Be sure to peek at the “Prime Curios” page. It contains intriguing facts about prime numbers both large and small. For instance, did you know that 773 is both the only three-digit iccanobiF prime and the largest three-digit unholey prime? I sure didn’t. Last but not least, I ran across this article about how a software company has come up with a new solution for mixing colors on a computer screen by using six dimensions rather than the usual three. Dimensions of colors, you ask? Well, there are actually several ways that computers store colors. Each of them encodes colors using three numbers. For instance, one method builds colors by giving one number each to the primary colors yellow, red, and blue. Another systems assigns a number to each of hue, saturation, and brightness. More on these systems here. In any of these systems, you can picture a given color as sitting within a three-dimensional color cube, based on its three numbers. A color cube, based on the RGB (red, green, blue) system. If you numerically average two colors in these systems, you don’t actually end up with the color that you’d get by mixing paint of those two colors. Now, both scientists and artists think about combining colors in two ways—combining colored lights and combining colored pigments, or paints. These are called additive and subtractive color models—more on that here. The breakthrough that the folks at the software company FiftyThree made was to assign six numbers to each color—that is, to use both additive and subtractive ideas at the same time. 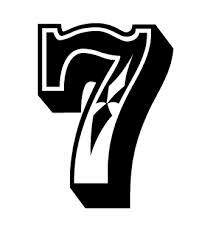 The six numbers assigned to a given number can be thought of as plotting a point in a six-dimensional space—or inside of a hyper-hyper-hypercube. I think it’s amazing that using math in this creative way helps to solve a nagging artistic problem. To get a feel for why mixing colors using the usual three-coordinate system is such a problem, you might try your hand at this color matching game. For even more info about the math of color, there’s some interesting stuff on this webpage.